Valarie’s intention for clarity and truth combined with her appreciation of the “beauty way” create an environment for deep healing to occur. Her love of the sacred is undercurrent of each session. Her knack for the mysterious, the unseen, enhance her ability to track a person’s soul into the farthest reaches of its experience on Earth, in order to reconnect with those aspects that are waiting to be integrated into a natural state of wholeness. Valarie brings over 20 years of private practice experience to each session, and knows that it is her grounded presence, integrity, open heart, and reverence for the Divine that guides every aspect of her work. Valarie first had conscious contact with beings on the other of veil at the age of 6 when her father crossed over and came to her to say goodbye. At the age of 15 she began to communicate with other beings of light and knowledge, channeling their information into personal journals. 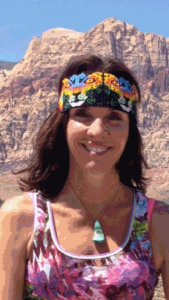 In 1985 she began work as massage therapist and body worker, and continued her studies of the body and the energy field through numerous modalities. Her training includes Shamanic Energy Healing, Rebirthing, Radionics, Color, Light and Sound Technologies as Well as herbal medicine with Hanna Kroeger, Reiki Master, Cranial Sacral certification. In 1986 Valarie connected to the Native American (Lakota) healing traditions of sweat lodges and vision quests and in these ways she remembered the power of the ancient lineages of medicine men and women throughout time, In 1994 she began global travel to work with the indigenous healers of Australia, New Zealand. Mexico, Japan, Brazil, Hawaii, and Peru. In 1996 she was initiated into the Shamanic Ceremonial Works of the Church Of Brazil in Sao Paulo. Valarie was asked to bring the Shamanic Work of the Church home to Las Vegas, NV and California where she journeyed both groups and individuals for the purpose of awakening consciousness and healing from 1996-2002. Valarie has been a conscious Medium for many years and uses her skills to contact relatives and friends from the other side of the veil, in order for her clients to find peace and to have closure in their lives. She also uses her gifts to send spirits who our stuck in our world, home to God’s light. Valarie Specilaizes in removing Dark Magic. Anything having to do with Hexes, Curses, or Spells. That were put on an individual, a family member or a whole family lineage. Valarie has the ability to track through time and unwind all these complexities. Most recently, Valarie received certification through The Four Winds Society’s Healing the Light Body program in 2008. This is the work of the lnka Shaman, the Q’ero, taught by Alberto Villoldo. She has also received ordination from the Universal Life Church in 1991, and The Sanctuary of the Beloved Orders of Melchizedek in 2001. Valarie has lived in Las Vegas, NV. since 1984. Where she sees clients in person and long-distance. Valarie’s training also includes over 30 certifications. Reiki Master, Radionics, Rebirthing, Hanna Kroger Healing, Insititute of Integral Health. Desert Moon Circle Initiations, Lakota Vision Quests and trainings and sweatlodges. Pipe Carrier for the people. Past Lives, Mediumship. Served Ayahuasca for 6 years for the church of Brazil. Sao Du Mar. Betsy Bergstrom Trainings. Vortex Healing trainings. © 2019 Valarie Zuvuya. All Rights Reserved.